Another month, another shower gel! Bath & Body Works describes this scent as a "calming fresh cucumber essence that is wonderfully infused with natural green tea, creating a soothing therapeutic scent", and I agree! Green Tea and Cucumber Essence is a refreshing, crisp, summery blend of cucumber, green tea and freshly cut grass. 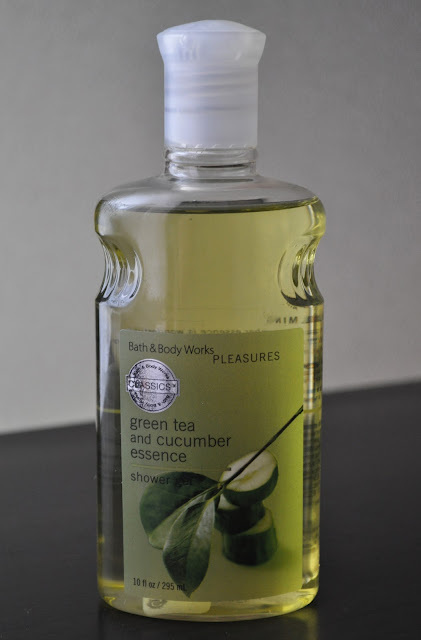 Sadly, Bath and Body Works has discontinued this fragrance line :( After I checked my shower gel stash, I almost began hyperventilating the moment I realized that I was down to my last bottle of Green Tea and Cucumber Essence Shower Gel! Green Tea and Cucumber Essence is one of my favorite summer shower gels and now it's gone! Oh well...there's always ebay right??? What fragrance are you enjoying at the moment? This is my first time i visit here. I found so many interesting stuff in your blog especially its discussion.Thanks a lot for that enormously amazing post!